Compatible with: Any theme & Editor like Gutenberg,Elementor, Visual Composer, Beaver Builder etc. Image Sliders are bad for conversions and they cause banner blindness. They are boring and do not engage users. Eye tracking studies conducted by Neilson Norman Group found that as soon as visitors perceived something to be an advertisement they turned their focus away from it. Image sliders divide your user’s attention. Images on sliders represent different products or offers in the span of a few seconds. Your website user has hardly read a single thing when whoosh…the image changes and they have to refocus their attention. Slider Hero is different. This WordPress Slider plugin focuses on your core messages, uses a background animation of your choice or a video background to keep the user interested and focused. The unique Call to Action buttons lead the users where they really need to be. 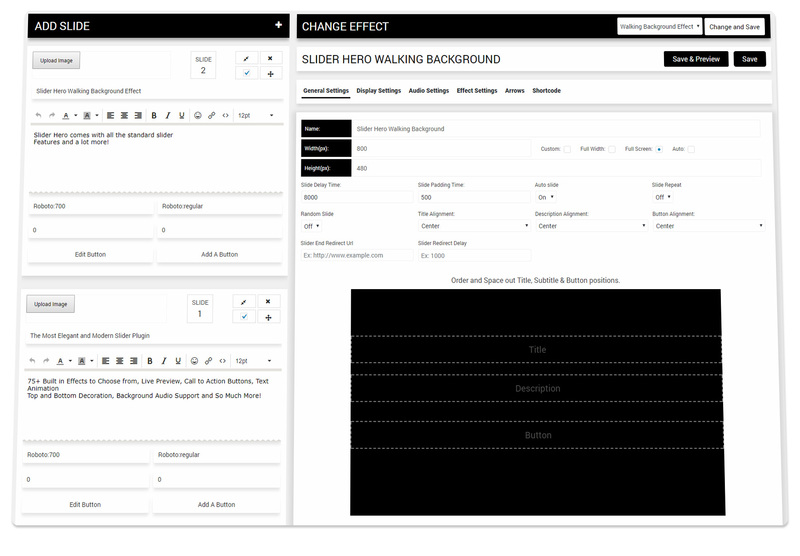 The other unique feature that Slider Hero provides is the Intro Advert builder. Introduce your products and services with a dramatic flair. 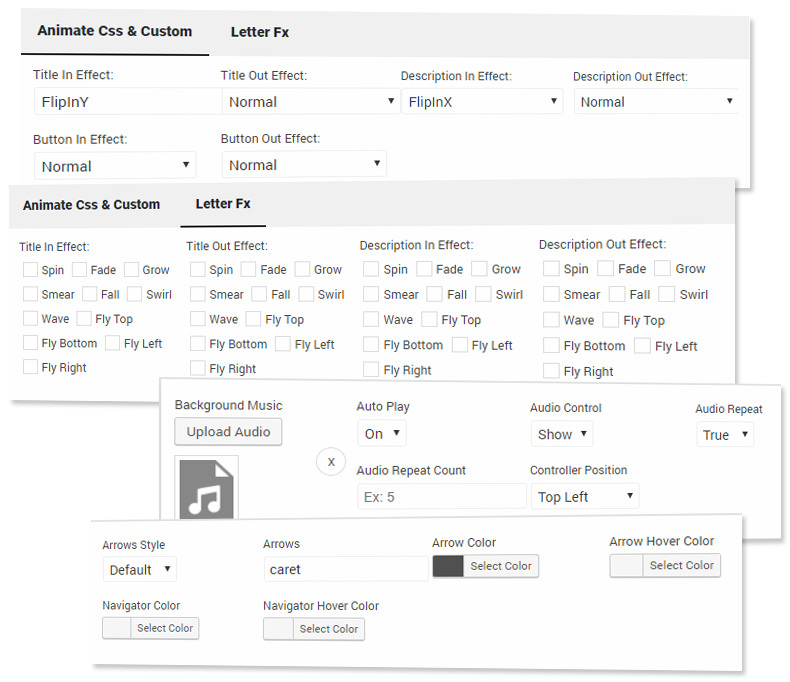 Slider Hero typographic intro builder allows you to do something very unique. You can create stunning product introduction sliders like stunning Intros like “Apple – iPhone 7 and iPhone 7 Plus in 107 seconds” with chained animation and small snippets of texts combined with background audio of your choice. Each text snippet can be assigned different text animation effect, animation delay, colors, backgrounds, font etc. Upload a music loop and voila – instant awesomeness. You can use Intro sliders for your splash page, coming soon page, product launch, and landing pages. What happens at the end of your epic Intro? Redirect visitors to a new page or load a regular slide with call to action buttons! Create unforgettable user experiences with Slider Hero Intro Builder – Unleash your inner movie director. 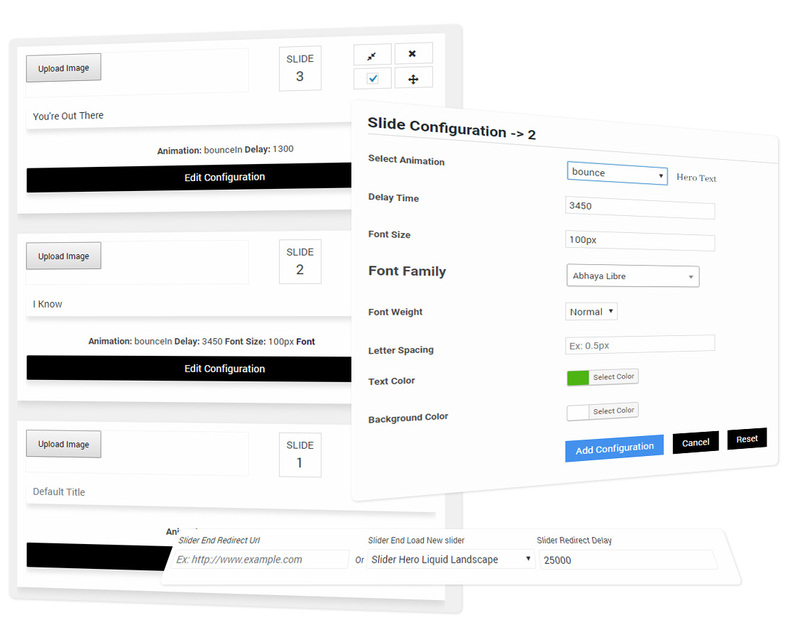 Slider Hero takes all the messy work out of your slider creation process. Create awesome, futuristic sliders with just the click of a few buttons. Select an Effect->Create a few slides with title and descriptions->Copy shortcode to your page and you are done! Change the animation effect instantly from a handy dropdown list any time for different occasions or when you feel like experimenting. The minimalist, intuitive and user-friendly interface lays out all the options and effects in a single page – easily accessible and in formats that just makes sense. Nothing overwhelming but nothing is missing either! Slider Hero is a WordPress slider with embedded video support! Create a Slider with Video Background by uploading your own video files or use a Youtube Video or Vimeo Video. Loop the Video background, Mute the video and Set a color overlay with opacity if you like! Slider Hero supports video Sliders! You can create Youtube Video Slider, Vimeo Video Slider or upload Custom Videos and Slide them across the screen with or without your text on top easily and quickly! 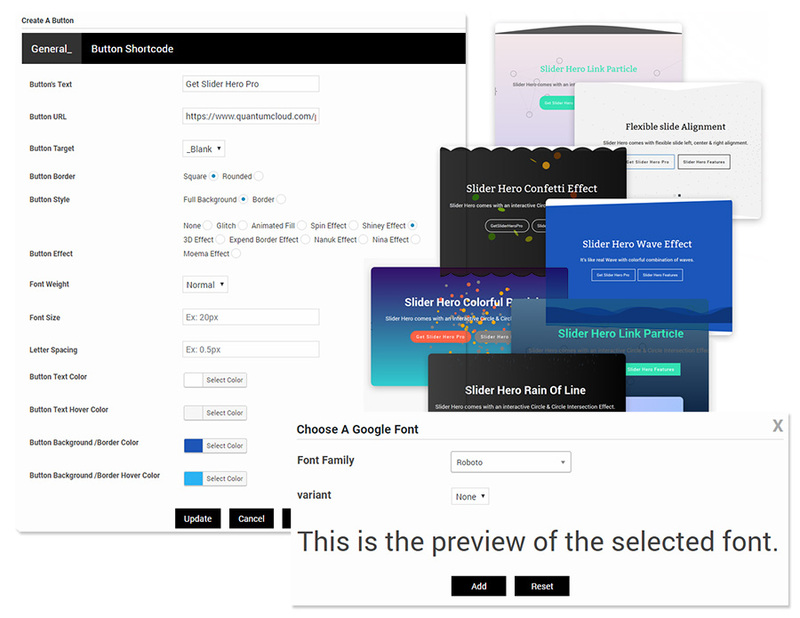 Slider Hero provides enough animation options keep your slides interesting. Combine the flexibility of animate.css with the power of letterfx to create unlimited, unique text animations for your titles and descriptions. Apply In and Out effects for Call to actions buttons along with unique Hover animation effects. 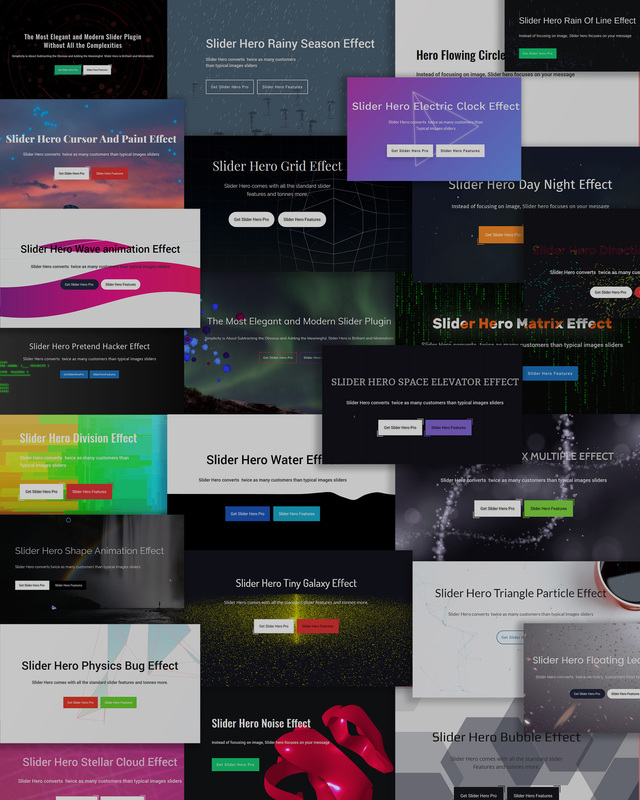 There is never a dull moment when you create slideshows with Slider Hero. Use as Background Image Slider with or without text carousel and effects. # New ripples library added for IOS mobile support. # canvas z-index issue for image slide fixed globally. # New and better Transition effects added for image slide. # Better Transition effects added for background image slide. # Shortcode in description disappears issue - fixed. # No Effect, Image slide preloader added. # Floating arrow z-index issue fixed. # Page background animation added (experimental). # Default delay 12000 - done. # Campfire position setting added in Effect setting section(Center, Left, Right). # Preloader shortcode option added in settings help section. # Font select preview does not stay issue - fixed. # Audio Control position issue - fixed. # Floating arrow z-index issue - fixed. # Text effect alignment issue - fixed. # Slide jerking issue in some cases fixed. # Backend font-family change issue - fixed. # Play or work Effect issue fixed. # Button button margin - option added. # Title bottom margin - option added. # Container width 100% added. # Remove absoulate position for title, description, button. # Effect optimized - Rays and particles, Rainy season. # Mobile responsive issue fixed. # Fireworks title font-size issue fixed. # fizzy spark touch issue fixed. # Walking background safari issue fixed. # Fizzy spark effect touch problem fixed. # Line effect, Electric Spark, Hilex, Distance, Liquid Landscape - qc site issue fixed. # Change effect form method change - get to post.